I loved your self-made wardrobe project, and I miss it now that it is concluded! As a maker of clothing for myself for 40 years. I found myself cheering you on, and really enjoying your analysis of the whole project. For me, making my own clothes is all about getting exactly the clothes I want to wear, in the colors and fabrics I want ( mainly natural fibers), and the challenge of seeing my ideas emerge in reality. Secondarily it is about cost, since the cost of my time limits the production of clothing for me, and makes some things ( like a new sweater) extremely expensive in terms of time. Enjoyment is a huge factor, and the satisfaction that comes with creating something comfortable, wearable and unique for me. I applaud you and look forward to seeing what you make next! Thank you so much Jeri! I’m glad you enjoyed the project. And thanks for weighing in about why you make things – we all have our own personal reasons for why we make, and I think enjoyment & satisfaction are huge motivations for a lot of people. I love that you’ve been making yourself clothes for 40 years! Are your shawl books available in hard copy. p.j. darbyshire – They are not currently available in hard copy. If they ever do become available, I’ll be sure to announce it here on the blog, and to my newsletter. This is a fascinating post (I love data) and really thorough. One more aspect you could consider is the environmental cost of clothing. 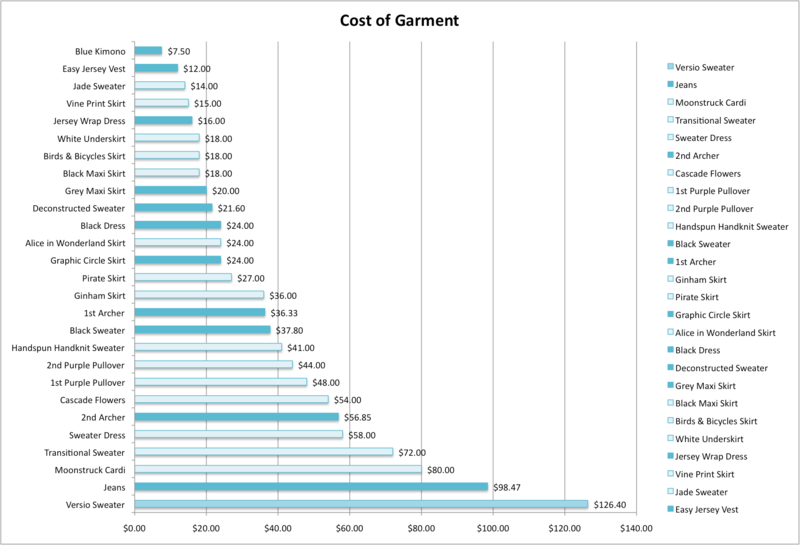 It would be nearly impossible to estimate the dollar value, but as a rough comparison, store bought clothes accumulate environmental costs at every stage of their production from sourcing the raw materials for the fabric, dyeing the fabric, shipping the fabric to the factory where the garment was assembled, the factory itself, then shipping it overseas to stores, then person driving to store to purchase, the plastic bag you take it home in, and then the junk heap you toss it in 2 years later (most donated clothing end up overseas or a landfill because they just don’t sell). All of that shipping back and forth and production adds carbon and waste products to the environment, which all take a toll. Meanwhile, made-by-hand-with-love clothing accumulate a fraction of those costs at the raw material stage of things and would theoretically live a much longer useful life before being junked. So while the raw materials might be just as costly as buying a garment, in my opinion, handmade clothing is less expensive when the environmental impact is considered. Yes! Alicia! – I didn’t even try to touch on the environmental impact of shipping clothing in it’s various incarnations between mills & factories & warehouses & stores. Let alone the waste and pollution at each step of the growing/spinning/weaving/dyeing/sewing/etc. And while all store bought fabric certainly isn’t blameless in this (at least not the fabric piled up in NYC’s garment district) – I do think that being involved in the process of making clothes, at least prompts us to search for ethically produced and environmentally friendly materials, fabrics, clothing, accessories, etc. And this also brings up the issue of “out of pocket expense” and “socially covered expense” – by that I mean the expense of a more expensive a sustainably produced piece of clothing, comes out of the pocket of an individual and the benefits are shared socially, while the expense of cheap clothing is diffused out across the entire chain and the disadvantages are also shared. I loved this post. I’m not familiar with fabric and notions prices, but was a bit surprised at how expensive the jeans were. Was it the denim? I’m so glad you liked the post – and thanks for the question, it’s a really excellent one! The denim, materials & notions for the jeans weren’t actually very expensive – the thing that increased the price of that project were two Craftsy classes I bought on making jeans. This kind of really skews the price up when compared with the other pieces in my wardrobe, since this is the only piece of clothing I bought classes for, and there were only 2 or 3 other pieces that I bought patterns for. 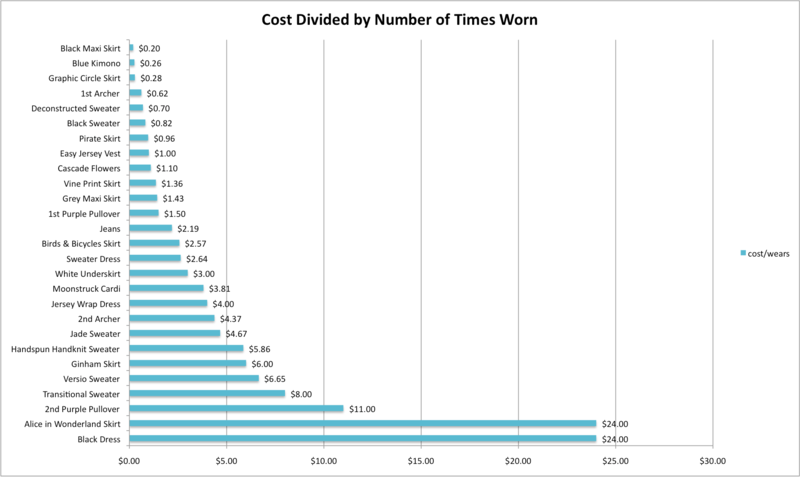 I debated if I should include patterns & classes in the price of the garment since I used so few of them – but decided that since the knowledge from the pattern/class is integral to finishing the project, then the cost certainly shouldn’t be left out of calculating the cost of the garment. This is such an insightful post! I think in the end your handmade wardrobe project has inspired me to take on more sewing and finally getting some skills there. Sure, there are many valid points for buying store bought clothing, but I don’t think they can ever outweigh the positives of handmade with love. I think there for one is an entirely different mindset into just buying something, because it’s cheap and who cares, compared to investing time into something. And just because of the time investment alone there’s more reason to take a moment and think. Do I need this, do I love this, will I wear this? I currently have a wardrobe that is overfilled with cheap garments, many of which are falling apart and it is madness to be honest. And then I haven’t even touched upon the ethical aspect yet. Thanks so much for sharing this, I’ve really loved these overviews of your 1 year of handmade wardrobe! yay! I’m so glad this project inspired you sew more, Tahnee! And that you’re totally right that making vs buying clothes, is hugely connected to the mindset we have when we think about clothing. Time is such a huge factor in forcing us to think a little more intentionally about our clothing choices – with fast fashion, it’s so easy to forget how labor & resource intensive fabric, and clothing are. The making aspect, prompts us to pause for a second and think a little harder about what we really want our wardrobe to be, and how we want to interact with it. Well stated analysis. I agree. For me there are other variables and weighs, for example my fluctuating weight, my apparent inability to predict what I’ll wear or not, and my enthusiasm or lack thereof towards either shopping, sewing, or knitting. It could be that a pencil skirt or an A-line skirt is one of the cheapest things to make as opposed to buying it. But if every visit to the fabric shop one buys fabric one does not use, that fabric counts too. And like you said, classes, patterns, books, magazines, sewing machine, scissors etc. 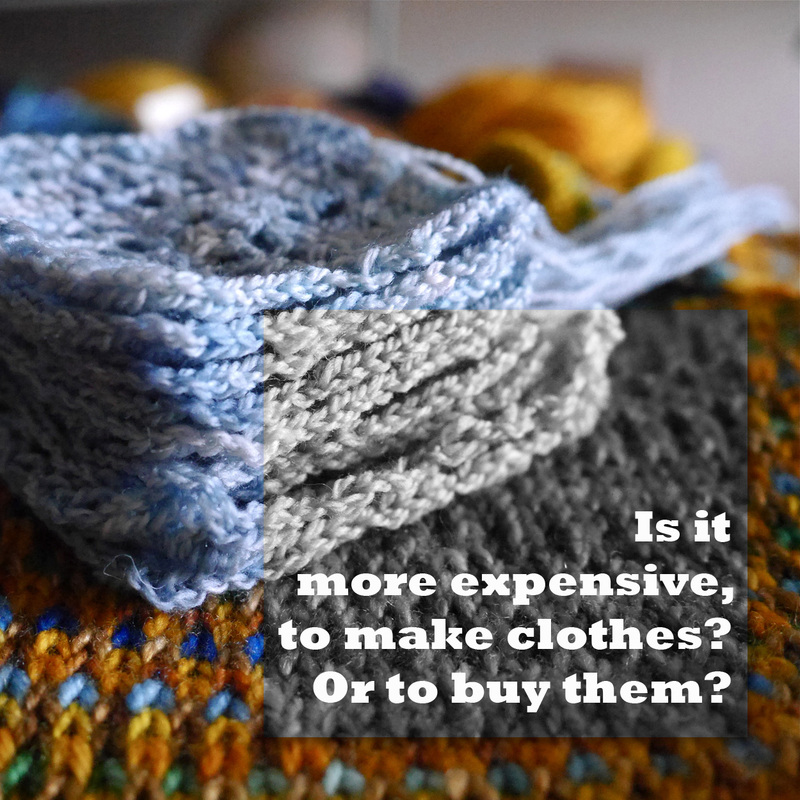 So I think sewing and knitting are hobbies, and as all hobbies they cost money, but some of that money comes back to you by making you buy less clothes (or not…!). It would seem to be incorrect to say that making your own clothes saves money. Only that given that you have this hobby with all of its expenses, it might save money when you want curtains / hemming / mending / etc and are willing to do it yourself rather than pay for someone else to do it or buy ready to wear clothing. I guess I probably think about this a little differently, because (for me) sewing & knitting aren’t just hobbies, they are also my job. And to throw another angle on this whole thing, it’s only rather recently (in the US), that sewing & knitting have become hobbies, as opposed to necessary skills for running a household.